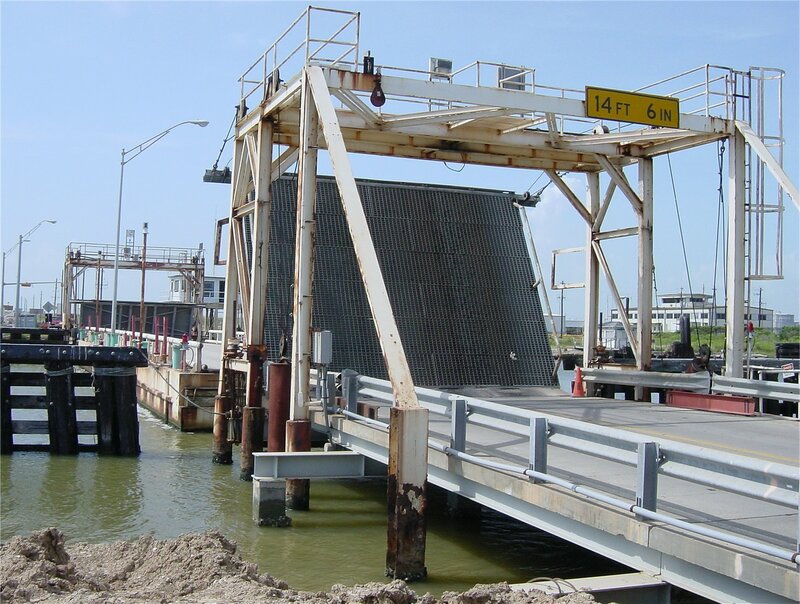 Just south of Freeport is one of those great curiosities that gets road enthusiasts excited: the Quintana swing bridge across the Intracoastal Canal. You may be wondering, what exactly is a swing bridge? In this case, it is a floating barge-type bridge that is pivoted out of the way when vessels need to pass. The diagram below illustrates this. Sadly, the swing bridge's days are nearing an end. A high clearance bridge is now under construction, and probably by the end of 2002, the swing bridge will perform its last swing. 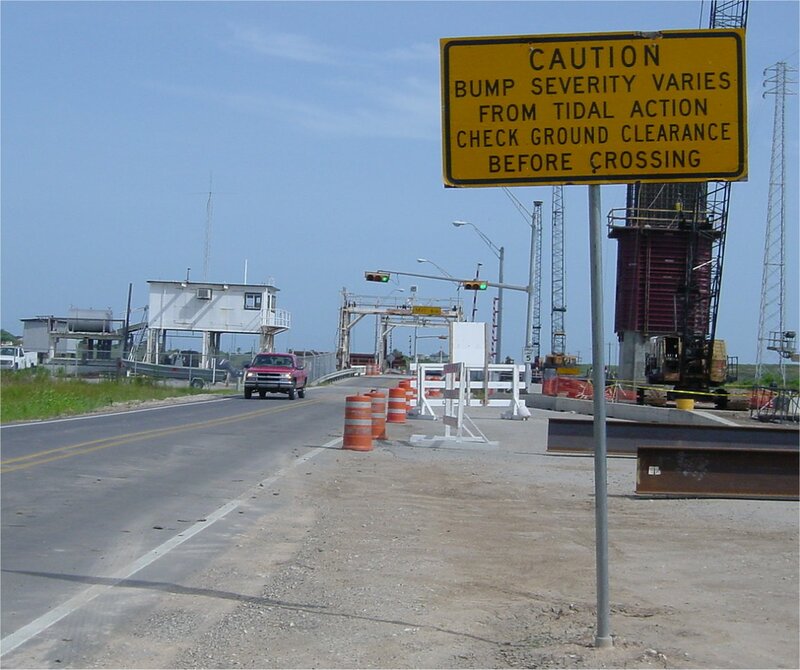 In April 2000, residents of Quintana Island appealed to the Texas Transportation to save the swing bridge and cancel plans to build the $10.7 million fixed span, high clearance bridge. Click here to see the testimony. Only about 100 people live on Quintana Island, and the total value of structures is about $6 million. But the high cost of operating this museum-piece bridge - about $400,000 per year - necessitated the new bridge. 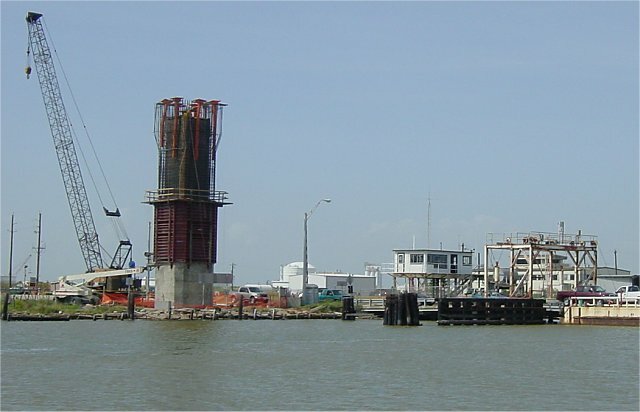 The contract for the $10.7 million bridge was awarded in January 2001. All is not lost for swing bridge enthusiasts, however. There are still two remaining swing bridges in Texas, both very close to Freeport. One is located about 20 miles down the coast on FM 457. The other is located about 40 miles down the coast at Matagorda. According to testimony at the Texas Transportation Commission in April 2000, Quintana is a man-made island and was incorporated in 1891. There has been a swing-type crossing at this location since about 1940. The present structure appears to have been installed around 1958. I found the historic photographs below of the construction of the present-day structure. 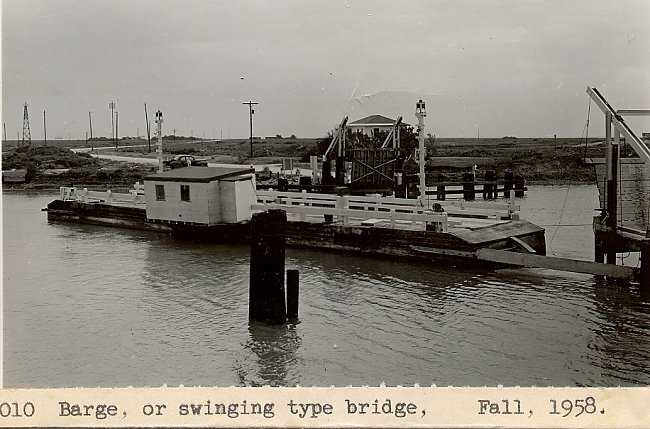 This photo shows the floating bridge in a swinging operation. Notice the small cabin on the center of the bridge span. I can't imagine a purpose for it, and it no longer exists. 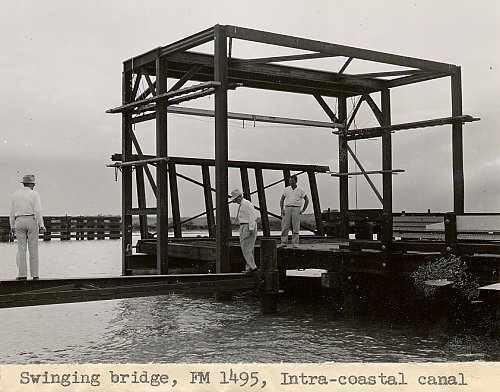 This photo shows construction of the one of the connection sections of the bridge, which features a short lift gate that connects the floating structure to the fixed structure. The guy is standing on the beam that connects to the floating bridge; this beam actually does the swing operation. (high resolution 182k) Approach to the bridge from the north. Photo taken 21-July-2001. (high resolution 128k) A view of the bridge in its normal position, open to vehicular traffic. Photo taken 21-July-2001. (high resolution 366k) The first step in the swing operation is the raising of the connecting sections at both ends of the bridge. Photo taken 21-July-2001. (high resolution 138k) The floating bridge is being pivoted to the side. Photo taken 21-July-2001. The bridge is fully pivoted and docked at the side of the intracoastal channel. Photo taken 21-July-2001. (high resolution 88k) The channel is now clear for vessels to pass. Photo taken 21-July-2001. (high resolution 120k) The vessel passes through. Photo taken 21-July-2001. The bridge is being closed as the towed pipe section end clears the bridge. Photo taken 21-July-2001. (high resolution 110k) This view shows the pier for the new high-clearance, fixed span crossing that is being built. The bridge will likely be similar or identical to the new 332 crossing just up the coast. Photo taken 21-July-2001. The new 332 bridge. The new bridge will probably look just like this, which is the new 332 bridge just up the coast. I believe this is a post-tensioned, cast-in-place concrete box girder design. For more photos of the 332 bridge, see the Freeport photo gallery. Photo taken 21-July-2001.